One hundred miles north of New York City, State Highway 52 spent twenty-five miles winding its way from the Delaware River to the town of Liberty, New York. They were beautiful miles, neat farms tucked into hardwood forests on a casual, small, two-lane country road. Just what my hitchhiking soul was looking to travel. Even though avoiding freeways was an aim of my travels, on this particular day I was trying to make it to Liberty just because it had a freeway passing by. Freeways mean substantial bridges. It was early spring and we can thank rain for the lush green of eastern forests. I was looking forward to a dry spot to sleep. I walked beside the narrow road without sticking out my thumb, thankful if rides were offered but not soliciting the attention of authorities. 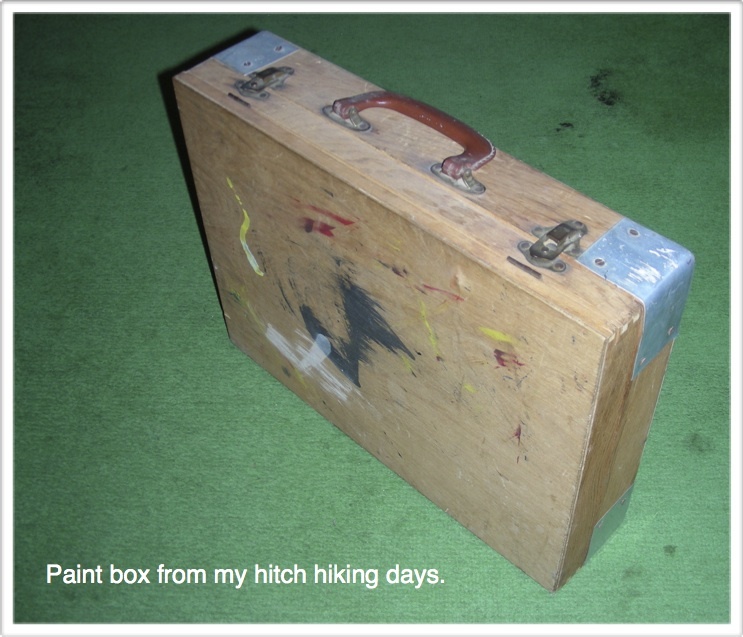 Besides, were I was going was exactly where I already was—hitchhiking America’s byways. One is not in a rush when one is already there. The countryside passed at the pace of a mosey. A couple of miles before Liberty there was a bluff I’d have to climb. The road bent to the left and became a steep grade, cresting the bluff with a sharp right turn some hundred feet above the valley I was walking. My fear was the grade was probably cut as shallow into the hill as possible to save costs, and my fear was right. As I approached I saw the road narrowed even more. The steep grade had no room on either side of the road. I could balance on top of the guardrail to the left, stumble over the steep loose dirt on the right, or walk on the road. A dangerous situation, indeed. The road up the grade was narrow enough so cars had barely enough room to pass one another even without a pedestrian to get around. The grade was long enough so no one would want to stay behind me for the length of it. The grade was short enough so oncoming traffic could appear at the top of the hill with precious little time to stop for a car passing me. And, most dangerous of all, if there was anywhere a cop would stop me for walking on the road, this would be it! But there was nothing to do. I quickened my pace, stepped into the road, and started scooting to the top. I hadn’t seen a car in miles and I hadn’t seen a patrol car in three days. So, of course, when I was half way up the hill and in the narrowest part of the road, what should appear at the top of the hill? You, dear reader, are an excellent guesser. The officer was alone, rather young, and began slowing as soon as he saw me. He stopped next to me, no room to pull over, set his brake, and started to get out. Even while he was opening the door he began expressing his concern about my walking on the road and especially in this very dangerous spot. I told him I agreed completely, was doing my best to get to past this very dangerous spot, but I had no choice since there were no rides. Along with my words of agreement there was a sincere laugh of admitting he and I could not agree more. 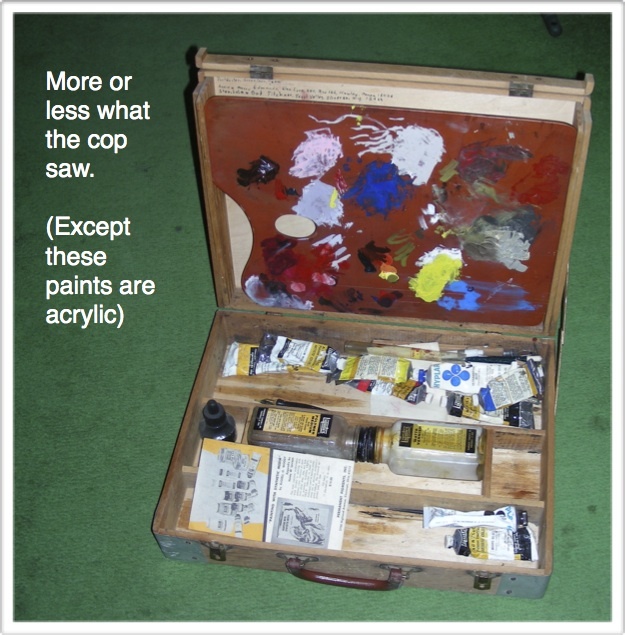 It was a wooden box, exactly the kind painters carry their paints in, and that’s exactly what I told him was in there. I told him about linseed oil and volunteered to show him, waving my box around looking for a place to set it. He motioned to the trunk of his car and I said I didn’t want to scratch it but he indicated that was the last of his worries. So I gently put the box on his car, popped open the lid, and showed him what to look for. We both knew we were blocking the road, so he soon thanked me and told me he was sorry—he wished he could give me a ride to Liberty but unfortunately he was heading the other way and had somewhere to get to. I scooted to the top of the grade, the curious cop being the only vehicle I encountered on the climb. This entry was posted in Hitchhiking and tagged cops, Highway 55, hitchhiking, Liberty NY, paint box on September 6, 2013 by deansgreatwahoo. Oh this is priceless! I especially love: One is not in a rush when one is already there. My thoughts exactly. You met the coolest cops of that decade! Thanks, Rangewriter. They were cool cops indeed. One more to go — just finished the first draft. Posting soon. I liked the already there attitude as well. Wise for such a young man. Your talent for relating to people was apparent than as now. Yes, a very good cope for sure. Loved the story.